If these were out of order and posted in the front of the room, how many times of singing this song would it take for us to put them in order? That’s the question I pose to the older primary children! Each of these statements is posted at the front of the room on a word strip. The children’s task is to put them in order while I sing the song. I start singing and tap a child on the shoulder to grab the first word strip and move it to the front. I tap another child almost immediately to get the second word strip and put it next in order. I keep tapping children’s shoulders and say “#4,” or “#6,” which ever number of child it is. 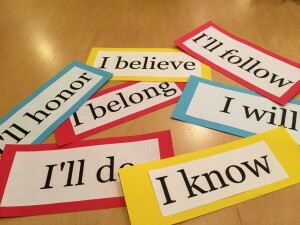 The children work as a group to try and get the “I” statements in order as they come in the song. The strength of this activity is that the children have to listen carefully to the words and repeat them in their mind (one of the strongest ways to order something in your head). Often they will repeat not just the words, but the melody and rhythm in order to get the order right. This is a super strong way for the brain to learn a melody with all the right timing because it is all done inside the brain with the brain producing the sounds! But that’s not the end of the activity! 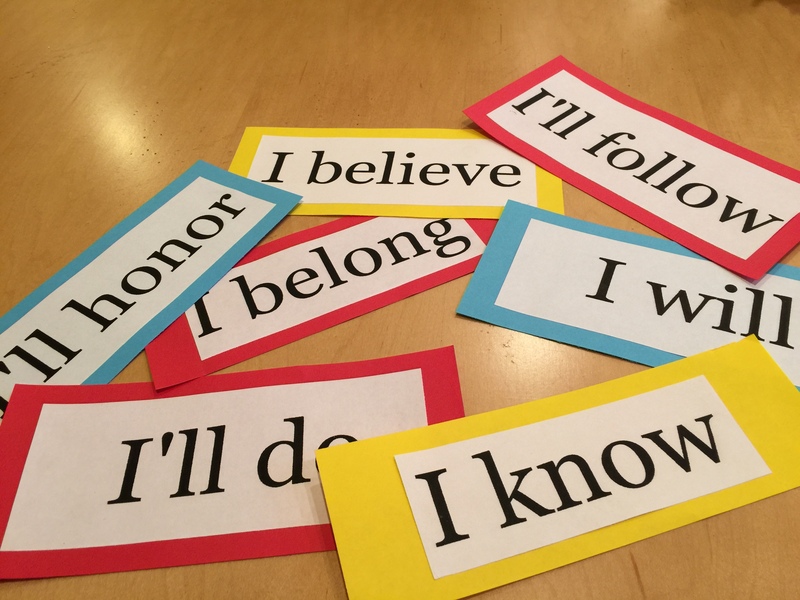 Once the words are all in order (and you have checked it with the children by singing through the song and pointing to each word strip), now ask the children to ONLY sing the words on the word strips! It is yet another challenge to sing inside (called audiation). Switch! Now sing ONLY the words that are NOT on the word strips. 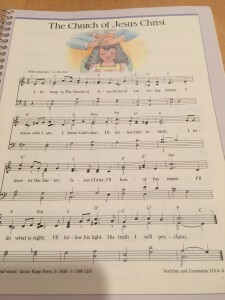 By now you have sung the song at least 4 to 5 times with extreme concentration and participation by the children. (Remember that participation is what Elder Bednar says is necessary for the Spirit to work with us.) Bear your testimony. It’s time for a change of pace after that much mental concentration, probably another song with some movement! I found your website when looking for ideas for singing in Primary. I am not a music person, but this is my favorite calling. it is so fun. I wanted to let you know I used the scarf idea both with my younger kids and with the older kids. They ABSOLUTELY LOVED IT. I used the song He Sent His Son. I just sang the song and told them they could sing or just listen to the words as I used the scarf to follow the softness and gentilness of the song. Then we talked about how the Holy Ghost bears a witness to the words and feeling of the song. The older Primary kids were called up to follow the music with the scarves. You could hear a pin drop it was so quiet, they nodded their heads when we talked about the Holy Ghost and our testimonies. What a wonderful idea. Thank you so much. I am going to work more on using movement and feelings. Thank you again for all your great knowledge and ideas. This made my day. What a great experience. It touched my heart and makes me smile! Thank you so much for all of your wonderful ideas! I love using movement to learn the songs and your ideas have been priceless to me so far in my calling as music leader. Please keep the ideas coming! If your Primary has all ages together, this is not an activity that will work. However if the older is separated from the younger, this works great. For the younger, I have several suggestions which I’m hoping to post today or tomorrow. (Seven Hops is one of the activities and it is already up posted if you’d like to look at it. Thanks for asking! I love the ability to sing the song a number of times while keeping their interest! You are Amazing with all of your abilities to teach! Thank you for sharing! Thanks again for sharing your talents and passion with the World. You are making a difference in children’s (and adult’s) lives and testimonies. Thank you so much for all of your ideas. You have a wonderful gift and I really appreciate you sharing it with the rest of us! We did this activity this past Sunday with Sr. Primary and they really enjoyed it. We were able to sing the song 5x while they put the word strips in order and twice more with the audiation! They loved the challenge!